With 85% natural ingredients, Boho Green Revolution 8-free Vegan Nail Base protects your nails and ensures safe and even application of nail polish. 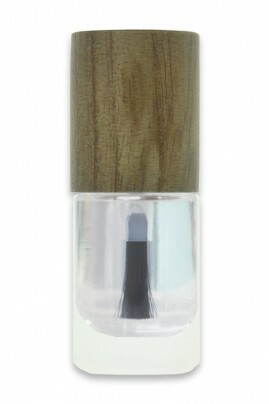 Easy to apply with its flat brush, this base can be used on its own like a transparent nail polish. Boho Nail Base is 8 FREE = NO toluene, formaldehyde, dibutyl phthalate, formaldehyde resin, paraben, xylene, camphor, streaks of colophony. Enfin une base sans produit nocif pour protéger l'ongle avant le vernis. A consommer sans modération ou presque. Nos ongles vous disent merci. Apply one layer of BOHO nail base, then 2 layers of Nail Polish, and finish up with a layer of top coat. The Base can be used on its own for a chic and discreet manicure. ETHYL ACETATE, BUTYL ACETATE, NITROCELLULOSE, ADIPIC ACID/NEOPENTYL GLYCOL/TRIMELLITIC ANHYDRIDE, COPOLYMER, ISOSORBIDE DICAPRYLATE/CAPRATE, ALCOHOL, N BUTYL ALCOHOL, ETOCRYLENE, WATER (AQUA), CAPRYLIC/CAPRIC TRIGLYCERIDE, PISTACIA LENTISCUS (MASTIC) GUM, TRIMETHYLPENTANEDIYL DIBENZOATE, ISOMALT, VIOLET 2 (CI 60725), LACTIC ACID, PHOSPHOLIPIDS, RHODODENDRON FERRUGINEUM LEAF CELL CULTURE EXTRACT, SODIUM BENZOATE. Très bon rapport qualité/prix. En plus, le flacon est très joli avec son bouchon en bois.